Batman is one of those stories I’m constantly conflicted about. I will always hate Batman because of its horrible ableist take on mental disorders and people who have them, but I will always love Batman because it has awesome characters who override my hatred. And at any given moment, I don’t know who my favorite character is. Is it Harley Quinn for her fun-loving personality and romantic and sexual interest in Ivy, or is it Jonathan Crane who I can easily headcanon as asexual? Other times, I relate more to Edward Nygma because of his obsessive-compulsive behavior. 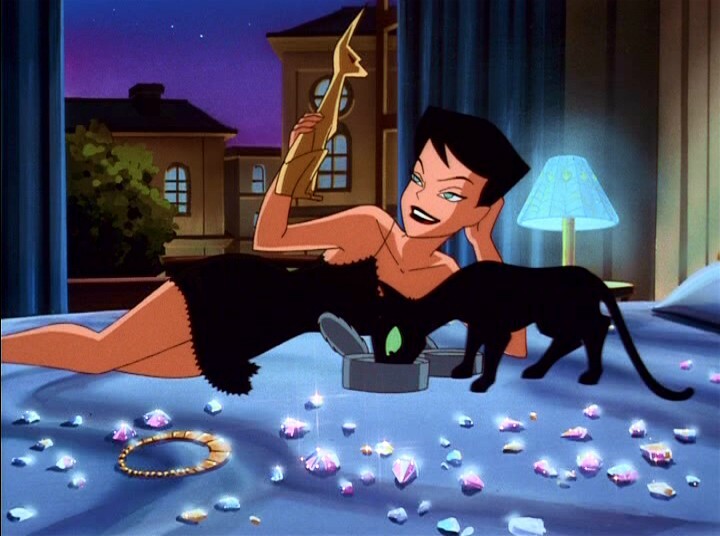 And then of course there’s Selina Kyle, who’s a sassy badass cat lady. And who doesn’t love a sassy badass cat lady? The Cat Problem gives me two characters I love in a situation I’ve grown to adore. It takes place after Edward Nygma’s reformation. Now working as a private detective and trying to stay on the right side of the law, our former Riddler finds himself stumped by a particular case involving arson—which is not something that happens often—when he gets a phone call from Selina. Lured in with the promise of wine and a relaxing evening with a friend, Edward readily takes a break from his case and heads on over to Selina’s place. There, he discovers her insidious trap. She’s leaving town for a few days, and she needs someone to babysit her cats for her. This is not a responsibility he looks forward to. “You want me to—what?” I should have stayed at work. Then I wouldn’t be sitting on Selina’s absurdly soft couch, dodging her attempts to coerce me into signing away my dignity. “It’s not that difficult.” Selina looked utterly unconcerned while she stroked the cat in her lap, a bright orange hellbeast appropriately named Pepper. Pepper glared at me with supreme loathing, as she did every time I visited Selina’s apartment. Needless to say, I did not get along with at least half of the cats that I met in this lush abode. “I’m not asking you to stay here for the entire week. I need somebody to drop by once or twice a day. Come here, I’ll show you why.” She jumped to her feet and left her living room, confident that I would follow. My first, petty inclination was to walk out the door, but… well… I did enjoy her company very much, and her whip was utterly terrifying. I rose awkwardly from the couch cushion that had half-devoured me and followed her, though not without misgivings. Pepper paced me, bristling and unhappy with my presence. Nothing new there. “I know why you need a catsitter for your oh-so mysterious last-minute trip—I’m sure there’s nothing illegal going on there, hm?—you need a catsitter because you hoard cats. I bet some asinine reality TV show exists that could get a good episode or two out of you.” We moved toward the back half of her apartment, which I had never seen before. Selina tended to be a very private and secretive person. Rather like me, really. Eventually, Edward gives in and agrees to help Selina out, much to her delight. As the story continues, he keeps working his case while heading over to Selina’s daily to feed her pets. Each cat he deals with has a specific personality, and at first he and the animals don’t get along. Some of the cats are too hyper for him, one is downright mean, and a few others like to steal things. As Edward never bothered to learn any of their names, he instead invents names for them—he calls the kittens the Seven Princes of Hell, the mean cat the Colonel—but probably the most memorable cat is Church, whom Edward is not even sure is alive. At any given time, it looks dead, and it doesn’t help that it’s also one of the more hideous cats in the apartment. Edward never sees it do anything but lie around unmoving, and he certainly never sees it eat, but whenever he comes by the apartment it’s always in a different position. My fifth charge today, Church the Possibly Dead, was sprawled over the back of the couch, all four legs hanging down either side. As I passed him I noticed an unsavory odor lingering around the cat. My nose wrinkled in disdain, I poked it once, received no response, and moved on. 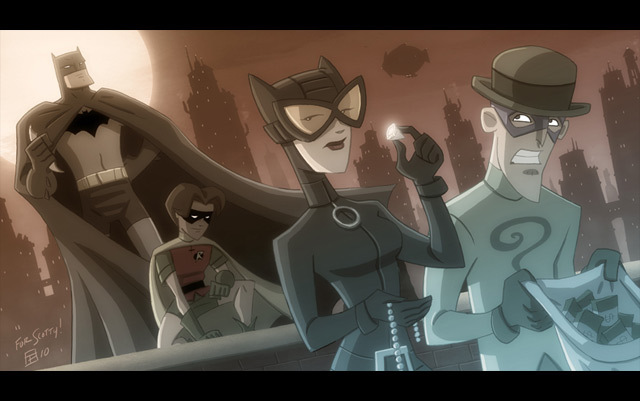 Despite the hijinks he has watching over Selina’s cats, the story does have a lot of serious moments. Edward still has his case to work on, and as he starts to figure things out he realizes that Firefly is involved. This naturally puts Edward on edge, as any case that gets him on a fellow rogue’s bad side should, and we learn that he was right to worry. Firefly breaks into Edward’s apartment and threatens to kill him should he continue his investigation. Unable to let it go, however, Edward continues looking into things, but to avoid Firefly, he decides to work from Selina’s apartment. This does not go well him, as Firefly just tracks him down there and sets everything on fire. Batman shows up to save the day as he’s wont to do, while Edward desperately tries to save all of Selina’s cats. After Batman subdues Firefly, Edward guilts the Dark Knight into helping him find Selina’s pets—which Batman agrees to do, if only because he likes Selina. Once Selina returns from her trip, she’s not too happy about the burned, uninhabitable state of her apartment, but she certainly appreciates all her cats being alive and even forces Edward to keep one as a gift. I love everything about The Cat Problem, from Edward’s attempts to watch after seventeen cats at once, to every scene involving Selina and their witty banter together. The reformed Riddler storyline was something I always loved from the comics, so I do have a soft spot in my heart for any fic that deals with it, and The Cat Problem does a wonderful job. It’s has a good balance between funny and serious, while also touching on some really good issues. Though Edward has been released from Arkham, he still struggles from his days as the Riddler and his obsessive-compulsive disorder. Once Firefly starts targeting him, he immediately thinks about building death traps, and he can’t let the case go now that he’s started it. We can see that though Edward is no longer ruled by his compulsions, he still has them. The interactions between him and Batman and him and Selina are also spot on and really well written. The Cat Problem is all kinds of a fun read, and you can check it out here on AO3. This entry was posted in Batman, Comics, DC Comics, fanfiction, fanfiction fridays, opinion, Reviews and tagged Batman, cats everywhere, Edward Nygma, raven_jem, Selina Kyle, The Cat Problem by MadameAce. Bookmark the permalink.